Kelly's Korner: I wanna be a COWGIRL! Mommas don't let your babies grow up to be Cowgirls! And this little cowgirl outfit! And these Cowboy boots - seriously are they not SO cute!!!!! I want to dress her up and take her to the rodeo or the county fair. This outfit is big so maybe next summer we will take her to the rodeo - JUST so she can wear this there. (and so momma can get a funnel cake). ha! Harper can be a cowgirl when she grows up if she wants. Or anything she wants to be! We will proud of her no matter what! I found this video by another little cowgirl, Taylor Swift, after I posted and I just had to add it on here. It made me cry. I hope the simple days I spend with Harper will make good memories for her. If you have a daughter (or a son) or a mom - try to watch this and not cry! Love her guts, she is so stinking cute in whatever she wears. I am really enjoying your blog, I'm glad I found it! Precious! She is so stink'in cute! I just bought Cilla a pair of Plum colored cowboy boots today! 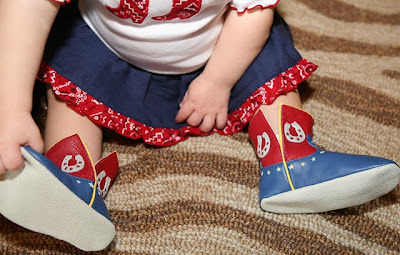 All Texan baby girls have to have some boots! I can't wait for her to wear them with her jeans and little dresses!!! Awwww...girls are too fun! wow thanks for the reminder of that verse! Hey girl! So I know we haven't met, but after being with Jenna this weekend, I totally FEEL like I know you. :) We had a blast and I just want you to know that the words "I wish Kelly could be here" were uttered approximately 1,274 times. totally in tears after about 50 seconds. Love this and Taylor Swift. Our babies are growing, my 1st baby will be 13 this month. Wow, time flies, and Aidan will be 8 months. Oh my, I am feeling the strong urge to have another baby, but then I think how hard it is with working. Love that song, and have not seen the video! Being a parent is so fulfilling! Addie told me the other day that we were BEST friends b.c we make each other happy!! My heart is full everytime I think of her saying that! (Now if she will just remember that when she is a teenager HA)! YOu are going to LOVE it when Harper can talk to you!!! Harper looks so sweet in her outfit!! LOVE this video! i hope audrey grows up and feels the same away about her mommy (me) and has mucho childhood memroies just like these! harper is one cute and lucky girl with you as her momma! Yes, EVERY moment we are making a memory for our children- I need to keep this at the forefront of my mind, next time I'm feeling frustrated or even just distracted. Beautiful video clip- and beautiful Harper- as always! This song is perfect and beautiful. Thanks for sharing! I love Harper's little cowgirl outfit! She is so precious! That video of Taylor is so sweet! Thanks for sharing! TS is so cute and talented! So is Harper! That video is so sweet! I am not even a momma yet, but it makes me wanna cry! Oh my WORD!! That is the cutest little cow girl I have EVER seen! I am crazy about those boots!! That video and song were so touching and of course Harper looks cute like always. What a cute cowgirl! It looks like she is getting a lot more hair! She is just too cute! I'm so glad you support both working and stay at home mommies. : ) It is such a hot topic and I love that you have a neutral, loving take on it! I love the verse you posted, it was very appropriate and couldn't come at a better time for me to read. Evy has the SAME outfit! I got it in Missouri. So cute!! What a sweet outfit! Every girl needs a pair of cowgirl boots! Oh my word Kelly, that song!!! I've never heard that before. How precious. Bailey told me the other day, "Mommy, you are the best mommy in whole world." Melt my heart. Awwww! She is just so precious in her little outfit! I was stopping by to let you know that I have an award for you! Stop by the address below to get it! Awww, how adorable is Harper in that little outfit. Too cute!! And what a nice gift. I remember reading back then about your husband promising Harper a pony. :) It almost makes a little choked up to think how far y'all have come since then. God works in such amazing ways. I always loved the church hymn "Count Your Blessings". Do you know that one? I can hear the words being sung right now. I love funnel cakes too! I blogged about them a couple of times now. I just cannot talk about them enough. Ha! Awww! Carlie had that same outfit when she was a little older than Harper! She wore it to the "Hogskin Festival" in Hampton, AR in 2004! She wasn't quite 2 years old! It brings back such sweet memories! Now my little princess is SEVEN....and wants to dress like Hannah Montana!! Enjoy it now!! Kamryn had that same cowgirl outfit when she was little and I LOVED it!! The boots are too cute for words. WAY cute outfit!Harper is adorable! Funny that you would post that video today,I just blogged about my husband and I going to a Taylor Swift Concert.Saw her mom and dad there as well.Love that song!Have a blessed week! Kelly I have been reading your blog since Harper was born...but finally had to comment. This song is just gorgeous and reminds me to treasure the days I have at home with my little guy. I love the outfit!! Thanks for the video as well! Tears started immediately. . . I had the same outfit growing up. My mom kept buying me one every year in a bigger size. That is one of the few outfits that I remember. Harper is so cute! She is such a cute little cowgirl!! I love that Taylor Swift song so much! I actully named my blog after it. I posted that video today as well. I didn't know it was on YouTube. I guess everything is these days. So Harper looks TOO cute as always! SO this video had me and my best friend balling in the car one day as we thought about our moms and getting ready to graduate. It was ESPECIALLY hard because we were at the point where we were going to leave our moms for school and WOW! My friend said this is so sad and I was like "Uh-Huh, whatever" and then it went on for about 60 seconds and it was SO my mom and I and I balled, just balled lol! I actually listened to it today on my ipod and it just makes me love and appreaciate my mom even more! Thanks for sharing! Nope, didn't make it. My mom is 12 hours from me and this makes me miss her so much more. Ha. I had red cowgirl boats and my mom told me that I would sleep in them I loved them so much. Precious outfit and boots and precious girl! I was already having kind of a "down" day....but I watched that video and just SOBBED. Oh my! Makes me want to take lots more video!!! I tried but I couldn't help it. I got all choked up! Now I want to go wake my baby girl up and love on her. I need to take more videos. Holy Cow! Could that post be any sweeter! That baby is growing up to be such a little sweetheart! Makes me think fondly back on my own 9 month old baby girl days! Thought of y'all this weekend as the Arkansas-Auburn game came on TV even all the way out here in SoCal! I knew of at least one place where the pig calls would be loud and proud! YOur lil cowgirl is just precious. So funny that I posted this Taylor Swift video on my facebook earlier today! I discovered the song after the twins and I spend the day with my parents best friends in Stuttgart a few weeks ago. As we left their house, my "Aunt" Betty started crying and said she'd had the best day with us and that I had to listen to this Taylor Swift song. I love TS. That was wonderful Kelly! Thanx for sharing! Oldest pulled up a chair to watch with me. At the end he said "Mama that was such a nice song wasn't it!?". If he only knew how wonderful it truly is! I love that song!!! The first time I heard it was when I was driving home for Gulf Shores this summer. I was listening to the whole cd all the way through, for the first time, and had to pull over because I was just pouring tears. It makes me think of my mom and hope that London will feel so fondly of me one day! That little outfit is SO cute! Oh my goodness...I seriously have that EXACT outfit, which seems weird since it looks hand made only mine is done w/ pink handkerchiefs...werid! And today I put my daughter in a western shirt and have been sing "I wanna be a cow(girl) baby!" All day. This post was too perfect today! Your little girl is so cute I love all that she does and wears! Thanks for the video. I didn't know that you were serious about the crying part. I didn't make it. I have 2 baby girls, I can't imagine them that big. Oh. My. Word. I SO NEEDED to read this post today and watch that precious video. I couldn't stop crying. Being a mommy is the most rewarding and challenging title a woman could ever have. Sweet Harper is just soo stinkin' cute. Love the cowgirl outfit. You're such an inspiration to me and so many others. One day Harper will be amazed at how amazing of a woman you are, Kelly. Keep up the good work!! That outfit is just adorable!! I love to dress my son up like he is a little cowboy. It's so much fun!! Love the song too. That has to be one of my favorite Taylor Swift songs. this is my favorite taylor swift song! Isn't that the sweetest song you've ever heard?? I love it and cry every time I hear it! I think that might be my favorite picture of Harper of ALL TIME! Kelly, she's such a belle! And that video....MELT! Even for a mom of 4 boys, it touched my heart. 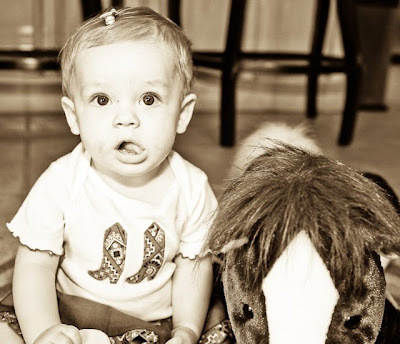 first and fore most, Harper is strikingly beautiful... its also evident that her mother is too! :) I really enjoy reading your blogs... I am new to this blog world lol, but I really like the fact that you are extremely devoted to God, Life is non existend without God. There is a reason why we are here. But Sometimes I feel That I have a dilemma :S but sometimes I feel that I dont... well I will be posting a blog right now if you get a change feel free to read it, I would like your advice you seem to understand. I almost made it through without crying- until the end when she start talking about her dad and brother. Ugh! I needed to hear this today cause seeing that, (and the reason I cryed), made me realize how fast the time is going to go by! It's so hard to believe that my almost 15 month old will be a 15 yr old soon! :( Loved it. Aww how cute in her cowgirl outfit! Oh and the video-so sweet. I do not have kids right now (TTC) but the video reminded me of me growing up with my family :-). I thank the Lord for such a loving Christian family. Thank you for sharing that. Just bawled my eyes out! So sweet! ok...totally made me cry! Now I'm off to kiss my sweet, sleeping girl. that is the cutest outfit!! :) it didn't take long to get her pony! Oh girl...you think it's hard to watch that video (and it IS)...just wait until you hear your 9 year old daughter sing it to you on stage in a talent show. Holy cow! That song tears me up! And Harper could NOT be any cuter!! Oh my gosh I just watched that video and cried and cried! p.s. Harper's outfit is so stinking cute!! my mom and my COWBOY brother danced to Mama's Don't let your babies grow up to be cowboys at his wedding a few weeks ago! That horse is cute. Lauren has a "neigh neigh" like that. i'm a complete wreck after watching that video. harper is such a doll! I just love Taylor Swift! I was watching the video thinking I wasn't going to cry and then the part with her painting started...needless to say, I cried! She is so stinkin' cute! :) I saw this video last week while I was feeding my son and I cried. It's such a sweet video! Harper is so precious! I cannot believe how long her hair is getting. That Cowgirl outfit is the cutest!! My "babies" are now 26 and almost 21 years old. I am proud to say that I am the Mother of 2 beautiful young women who have grown up to be not only my daughters, but my best friends!! Taylor's video brought tears to my eyes, thinking about the wonderful times I have spent with my own daughters over the years. And the many great times that we have ahead of us to still share with each other!!! Thanks for sharing. Harper looks adorable in her cowgirl outfit. Love & blessings from NC! That outfit is so adorable-especially the boots! love the verse, love the outfit, love the video!!! Oh my word. Let me just say that I love that outfit, that horse and Harper of course!! I LOVE Taylor Swift!!! And that song is without a doubt my favorite song of hers. I can't listen to it without crying and last time I checked my itunes count I'd listening to it over 200 times. However, I cry every time I listen to the song not because I have the kind of family Taylor has, but because I don't. I pray every day that someday when I have children... that I have a great relationship with them. And that's why I listen to that song. To help remind me what families are SUPPOSED to be like. Because I don't have a very clear example of that in my life. That song by Taylor Swift makes me cry every time I hear it!! I tell my girls all the time I hope they feel that way about me some day!! So special!!! We just love her!! PS - The outfit is precious!! Am off to see Taylor Swift next week - I cannot wait! I love that outfit! It is way too cute! The first time I heard that Taylor Swift song I cried everywhere! I didn't have a good relationship with my mom growing up (long story), and then she died when I was 18. My heart always grieves what we didn't have and what we won't ever have - and I miss her so. God blessed me with a beautiful little boy recently and I adore him to pieces. I hope to be the great things to him that I remember my mom being and even more. My heart SO longs to have a daughter too. Perhaps God will allow that to happen someday. In the mean time, I hope Tommy and I have some of the "best days" together. I love seeing your heart on your blog Kelly. You are such a sweet and tender woman and such a wonderful, wonderful mom. God gave Harper the biggest blessing of you. Thank you so much for posting this and sharing your life! I love seeing your precious little Harper. What a doll! My husband and I just found out we're pregnant (Praise God!) and this certainly turned on my waterworks! I have so many memories like that with my mama, and I hope our baby will have the same with me and my husband. She is such a cutie! Love Love Love those boots!! I cried because my daughter used to tell her friends, when she was in jr high and high school, that her best friend was her mom....and she is now 22 and is talking about marriage. Harper will be there before you know it. She is so cute...and I hope she tells everyone you are her best friend, too. Side note...my son works with the youth ministry at 1st Baptist in Hendersonville, TN - where Taylor Swift if from. Lots of the kids know her and her brother and they say she is the real deal. The town was proud to claim her after the Kanye West incident. Classy girl at a young age. Oh my goodness! Harper just makes any outfit that much more adorable!! Love the scripture you posted -- much needed today! Gotta love Taylor Swift!! We saw her in concert in Houston -- fantastic!!! Love that song and yes,it's hard to listen to without getting teary-eyed. Wow, when I watched that video, I cried like a baby at my desk at work! So sweet! And it made me think how much I love my mama! Cute as can be, Kelly!Love the boots. I just jumped over to your Mom's blog, and it's precious, too! I love this Taylor Swift song! The first time I heard it, I cried my eyes out. We were trying to get pregnant and it was such a special song to me. Now, I'm 22 weeks pregnant and it makes me cry more! SO funny you posted this song to your site. My daughter and I sing it all the time. My mom actually told me about the song and how it reminded her of me when I was little. The song brings tears to my eyes every time I hear it! The memories we make today will be soooo important to our kids tomorrow! Have a great day! She's so pretty!! Awww so cute cute cute!! I'm thinking of being a cowgirl for Halloween, but I dunno!! Aww, I can't wait to have a mini me!!!! That is the sweetest thing. Harper is so pretty - that blonde hair is getting thicker and thicker. What a precious pumpkin! I am so glad to see you just eat her up. What a blessing!! Oh my word, she is a doll!!!! She is getting so big so fast! The outfit is ADORABLE. I enjoyed this post...the video brought a tear to my eye. Sweet video! I live in TN in the same town as Taylor. I've seen her with her mom around town and they seem so close. Very cool. I LOVE having daughters, and I just pray they will be able to say, one day, that I am the strongest person they know! Oh, I dislike commenting on these posts, but just had to say something. Looks like a future Kilgore Rangerette to me:) With her love for music & dancing to follow soon. She is tooooo cute. LOVE the horse! You're right...that definitely made me cry! Cute pics and thanks for sharing that video. I love Taylor Swift and that was too sweet. Totally made me cry too. Aww! When I was little, i was addicted to these red cowboy boots. I would fight my mom over taking them off, and wore them to school, and bed, and..everywhere! I also told her I wanted to be a cowboy when I grew up. She said, "Now Sarah, God made you a girl, so you can't be a cowboy." I said-"Well, I wanna be a cowboy-girl, then"! LoL. I love this stage! Love the scripture too! Oh so true! Harper is adorable! She makes me miss my niece! I SERIOUSLY wanted my camera in Walmart the other day with those same pants!! They are dreadful!! I can so relate to that- I have a daughter that graduates from high school this year! Enjoy everyday because it flys!!! Those boots are ADORABLE! But not as cute as Harper. I smile everytime I see that sweet face. I had a western-themed birthday for one of my kids...made a boot-shaped cake and it was CUTE! oh, my! yes, I cried! Any chance you know the brand or where I can buy those shoes? I've been to every boutique in my area and can't find them anywhere. They are the perfect addition for a christening gift that I am hoping to give in two weeks.